Get up to speed on the latest Mac OS Getting a new Mac and not knowing how to use it is like getting a remote controlled car for Christmas with no batteries. Get up to speed on the latest Mac OS Getting a new Mac and not knowing how to use it is like getting a remote controlled car for Christmas with no batteries. 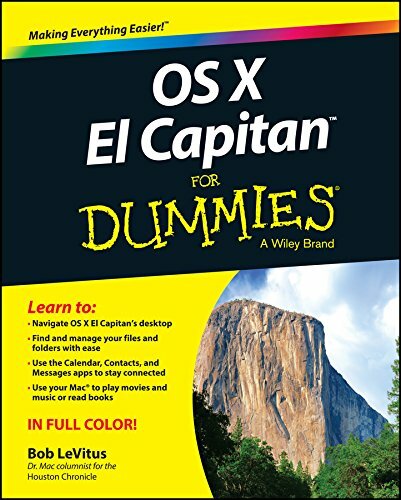 OS X For Dummies powers your understanding of the latest Mac operating system through straightforward, fun content that covers the basic features and functions you need to know. An essential text if you're not already familiar with Apple technology, this resource walks you through the fundamentals of Apple's Mac OS, shows you how to customize your workspace, work with the Dock, leverage the Finder and Finder Tabs, understand files, folders, and tags, find things with Spotlight, use Mission Control and Launchpad, organize your life through Calendar, Reminders, Notes, and Notifications, and much more. Apple is one of the most popular technology companies in the world, known for its ability to combine power and stability with style. Since all of Apple's products function according to its proprietary operating system, it's essential that you understand how to use the OS to make the most of your tech toys. * Take your communication to the next level with email and messaging capabilities * Enjoy multi-media entertainment by surfing the web and accessing movies, music, ebooks, and digital photos * Let your creative side run free with Text Edit * Create a seamless digital experience by connecting a printer, running multiple displays, networking, file sharing, backing up and restoring your system, and keeping your machine safe with Gatekeeper OS X For Dummies breaks down Apple's Mac operating system into bite-sized pieces, allowing you to digest small morsels of information that guide you in navigating your new Apple gadget.